Vegetable stock seems such a waste! 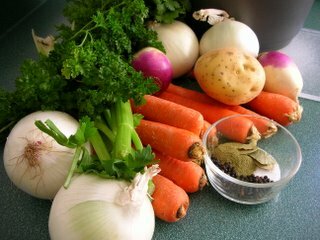 In my kitchen, chicken stock simmers away every couple of weeks where vegetable stock appears maybe (maybe) every couple of years. Still, after coaching my back-door neighbor through a potful a week ago -- she raved about the results, later -- it was definitely time to consider the possibilities of good vegetable stock. So here's the first batch. All 22 cups went into freezer bags so taste reports must follow. That said, the sample spoonful was fragrant and a lovely gold color, an apparent keeper. Now if I can only get over the idea of "wasting" all those glorious vegetables! Bring the water to a boil in a very large pot or two Dutch ovens over HIGH (or the hottest temperature your stockpot can manage). While the water comes to a boil, add the vegetables as they're prepped. Cover. (See TIPS.) Once the water reaches a boil, reduce the heat to MEDIUM and let simmer for 2 - 3 hours. Pour stock through a colander and transfer into storage containers (see TIPS). There are no comparable products in the USDA nutrition database used her. Still it's fair to estimate that this stock has virtually no calories even if it's difficult to speculate on vitamins and minerals. Thyme has great flavor but settled to the bottom and created a cloudy effect in the last of the stock. Next time I'll use a bunch of fresh thyme or use whole seeds that can be strained out. It's easy to walk away and forget that the stock's on the stove -- until you hear it spilling over. So I set the timer for every 5 or 10 minutes until it comes to a boil, turn down the heat and check it every 5 or 10 minutes until the simmer is stabilized. THEN it can be left completely unattended. Many recipes call for either four or six cups of stock -- four fills quart bags VERY full (too full to freeze, really) but works fine in gallon bags. I freeze the bags flat in the upstairs freezer, then transfer them to the basement chest freezer vertically so it's easy to pull out bags to see what's inside and oh dear, how long it's been there. thank you for the recipe! my sister keeps an old net-bag (like you get some vegetbales in) in the freezer & puts veggie scraps in it. when it gets full, she makes stock. Scraps like the ends of zucchini/carrots, onion/garlic skins, the kinds of things that you normally throw out but are edible. I started that awhile back, with cottage cheese containers but they were way too small and I forgot to keep it up. I'm thinking gallon-size freezer bags, what do you think, Anonymous? I luv making my own veggie stock, but I feel guilty about just tossing the veggies away. Anyone have an idea of what to do with them? We don't "waste" vegetables to make stock. Instead, everytime we make a dish that has veggie bits and pieces (like onion ends, carrot stubs, unused bits of broccoli, yada yada...) they go into a ziploc freezer bag in the freezer. When we have accumulated 3 or 4 large bags full, they go into a big stock pot with a half-dozen bay leaves and we make stock out of them. You don't need a recipe and the flavor is always outstanding. Can't be a gourmet vegetarian without a good veggie stock! Hi Chris ~ That's such a great tip, one I've gotten from several people. And I always have such good intentions as I peel and trim for supper vegetables. I even once got so far as starting a bag -- and then an ice storm hit and the house lost power and whoosh, into the rubbish bin went that lovely little bag of vegetable scraps. Thanks for re-inspiring me! 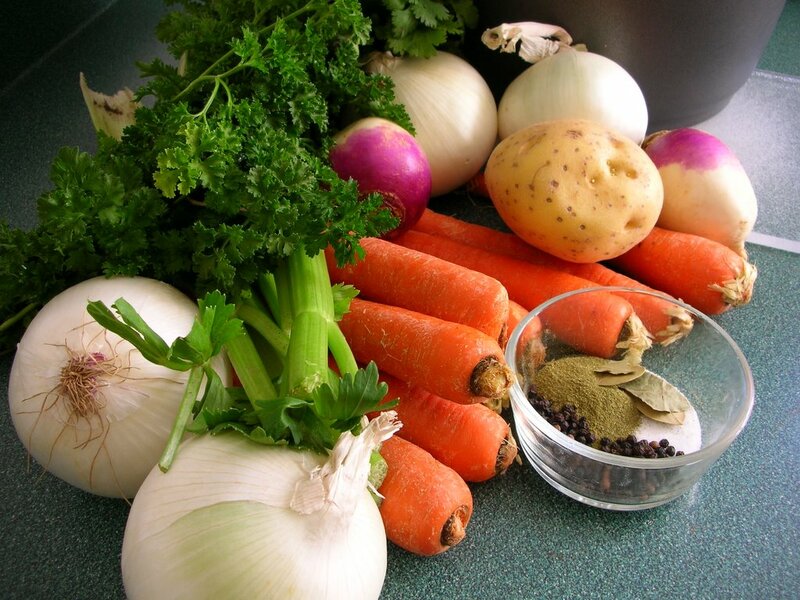 Alanna, when you are making light vegetable stock, I know it hurts to throw away the veggies after cooking so why don't you put them in the food processor and process them very fine. Then I keep a small bag out to mix in my little dogs food and the rest I put on a cookie sheet in a low oven and dry them out and put them in the bird feeder in my yard. The birds eat anything. We had steamed artichokes with dinner tonight. I'm wondering - do you think the tough leaves you don't eat could be used in stock? Anonymous ~ Y'know, I just don't know. I don't have enough experience with artichokes to say for sure. Did you try it?